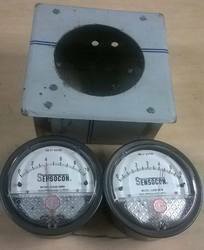 We have been continuously indulged in supplying a high quality array of GI Magnehelic Gauge Box to our highly valued consumers. Our products are highly acclaimed for their performance and quality. These are widely execute in numerous sectors. These products are gettable at leading market prices. 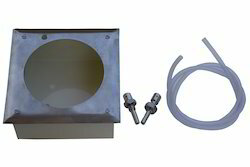 Wall Grouting Box is a Mild Steel Powder Coated Box with Stainless Steel Front Flush Plate for mounting Differential Pressure Gauges into Brick Walls / Modular Walls. 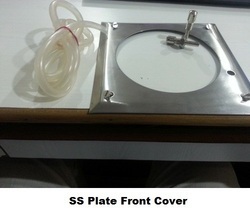 We are here to offer Magnehelic Gauge SS Plate Front Cover. It is designed to calibrate a broad spectrum of instruments from moving coil meters to process control systems and retain its precision over long periods in wide environmental conditions. These are customized as per as needs of clients. Used for high accuracy-guaranteed within 2% of full scale and for the wide choice of 81 models available to suit your needs precisely. Bezel provides flange for flush mounting in panel. Clear plastic face is highly resistant to breakage. Provides undistorted viewing of pointer and scale. 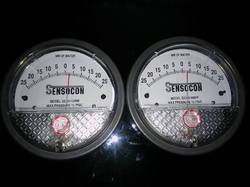 The Magnahelic guage is the industry standard to measure fan and blower pressures, filter resistance, air velocity, furnace draft, pressure drop across orifice plates, liquid levels with bubbler systems, and pressures in fluid amplifier or fluidic systems. 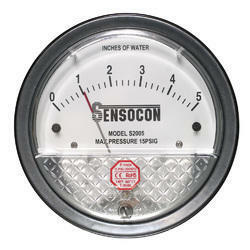 The gauge's motion is damped with high-viscosity silicone fluid. The zero adjustment screw is conveniently located in the plastic cover, and is accessible without removing the cover. O-ring seal provides pressure tightness. Rugged design resists shock, vibration, and overpressure. The helix is precision-made from an alloy of high magnetic permeability. Mounted in jeweled bearings, it turns freely, following the maganetic field to move the pointer across the scale. The samarium cobalt magnet is mounted at one end of the range spring and rotates the helix without mechanical linkages. -20 in Hg to 15 psig (-0.677 to 1.034 bar); MP option: 35 psig (2.41 bar); HP option: 80 psig (5.52 bar). This SS-304, SS-202, stainless steel hinged box has a polished satin finish. 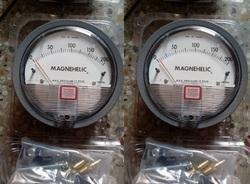 This box has a hinged door with a face cutout to accept a Dwyer magnehelic pressure gauge. Box comes complete with holes to accept pressure differential sensors. Box is fabricated with a flanged face for recess mounting. Bracket is Surface Mounted. Steel With Gray Hammer tone Epoxy Finish. For Use With Dwyer Series. 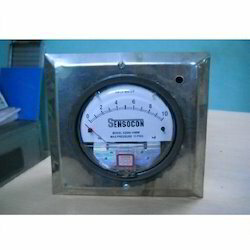 We are here to offer Magnehelic Gauge With S.S. Enclosure. It is designed to calibrate a broad spectrum of instruments from moving coil meters to process control systems and retain its precision over long periods in wide environmental conditions. These are customized as per as needs of clients. 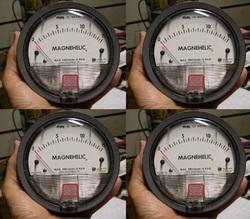 We are one of the topmost manufacturer, exporter and supplier of a superior quality range of MS Box Flesh type Magnehelic Gauge. These instruments are designed and made utilizing the finest grade raw material by following high definition engineering principles. Furthermore, these are widely appreciated for some of the salient features like accurate dimension, durability, superior performance and corrosion resistance. We provide these to our clients in both, standard and customized options according to the specific demands of customers. 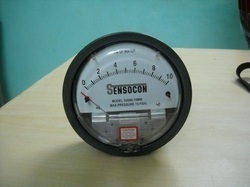 Used to access pressure measurement points . e.g either side of the filter on an Air Handling Unit. 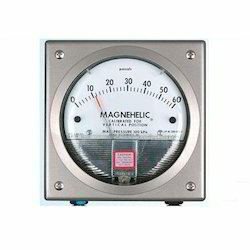 The Magnehelic gauge is the industry standard to measure fan and blower pressures, filter resistance, air velocity, furnace draft, pressure drop across orifice plates, liquid levels with bubbler systems, and pressures in fluid amplifier or fluidic systems. 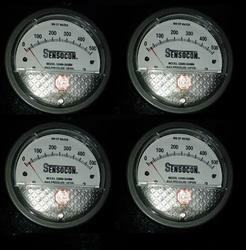 The gauge's motion is damped with high-viscosity silicone fluid. The zero adjustment screw is conveniently located in the plastic cover, and is accessible without removing the cover. O-ring seal provides pressure tightness. Rugged design resists shock, vibration, and overpressure. Select the MagnehelicA, gage for high accuracy--guaranteed within 2% of full scale and for the wide choice of 81 models available to suit your needs precisely. 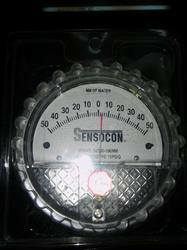 Using Dwyer's simple, frictionless MagnehelicA, gage movement, it quickly indicates low air or non-corrosive gas pressures--either positive, negative (vacuum) or differential. The design resists shock, vibration and over-pressures. 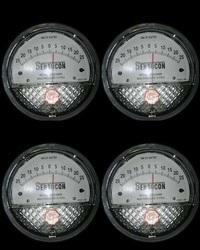 No manometer fluid to evaporate, freeze or cause toxic or leveling problems. 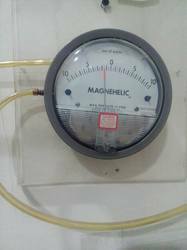 The MagnehelicA, gage is the industry standard to measure fan and blower pressures, filter resistance, air velocity, furnace draft, pressure drop across orifice plates, liquid levels with bubbler systems and pressures in fluid amplifier or fluidic systems. It also checks gas-air ratio controls and automatic valves, and monitors blood and respiratory pressures in medical care equipment. Note May be used with Hydrogen. Order a Buna-N diaphragm. Pressures must be less than 35 psi. 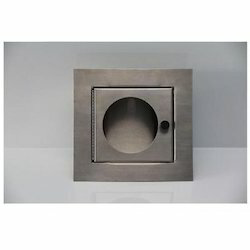 - Bezel provides flange for flush mounting in panel. - Clear plastic face is highly resistant to breakage. Provides undistorted viewing of pointer and scale. - Precision litho-printed scale is accurate and easy to read. - Red tipped pointer of heat treated aluminum tubing is easy to see. It is rigidly mounted on the helix shaft. - Pointer stops of molded rubber prevent pointer over-travel without damage. - "Wishbone" assembly provides mounting for helix, helix bearings and pointer shaft. - Jeweled bearings are shock-resistant mounted; provide virtually friction-free motion for helix. Motion damped with high viscosity silicone fluid. 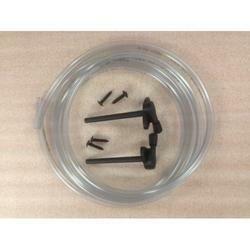 - Zero adjustment screw is conveniently located in the plastic cover, and is accessible without removing the cover. O-ring seal provides pressure tightness. - Helix is precision made from an alloy of high magnetic permeability. Mounted in jeweled bearings, it turns freely, following the magnetic field to move the pointer across the scale. - Samarium Cobalt magnet mounted at one end of range spring rotates helix without mechanical linkages. 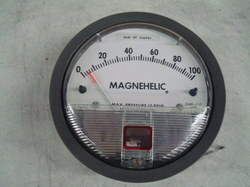 - Calibrated range spring is flat spring steel. Small amplitude of motion assures consistency and long life. It reacts to pressure on diaphragm. Live length adjustable for calibration. - Silicone rubber diaphragm with integrally molded O-ring is supported by front and rear plates. 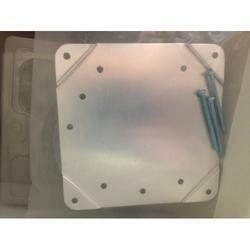 It is locked and sealed in position with a sealing plate and retaining ring. Diaphragm motion is restricted to prevent damage due to overpressures. - Die cast aluminum case is precision made and iridite-dipped to withstand 168 hour salt spray corrosion test. Exterior finished in baked dark gray hammerloid. One case size is used for all standard pressure options, and for both surface and flush mounting. - Blowout plug of silicone rubber protects against overpressure on 15 psig rated models. Opens at approximately 25 psig. - O-ring seal for cover assures pressure integrity of case. Looking for Mounting Options Dwyer Instruments ?